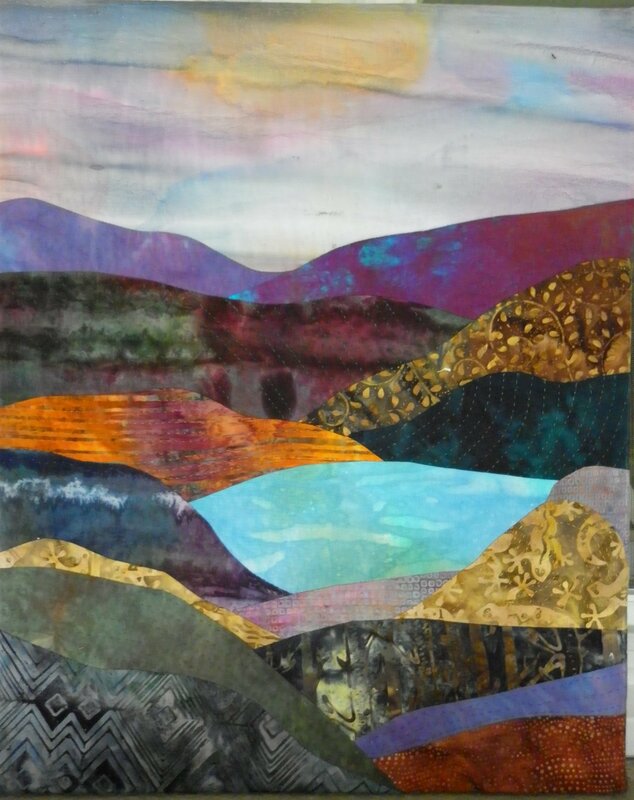 This quilt started with the decorator fabric that had swirling lines on it. I knew I wanted to use sheer fabric to make motifs to sew to the top so I quilted the background first outlining the curving lines. Then I just played with squares and rectangles of different colored sheers to come up with a hopefully interesting and balanced design. Since I love beads and buttons, I added the large green buttons to three corners of the center square and small black beads to the large black ribbon lines. The same fabric was used as a binding but I couched on another thin black ribbon to add a break between the body of the quilt and the binding. It measures 21″ x 2 1/2 inches (no idea why it did not end up a square-not that it matters). 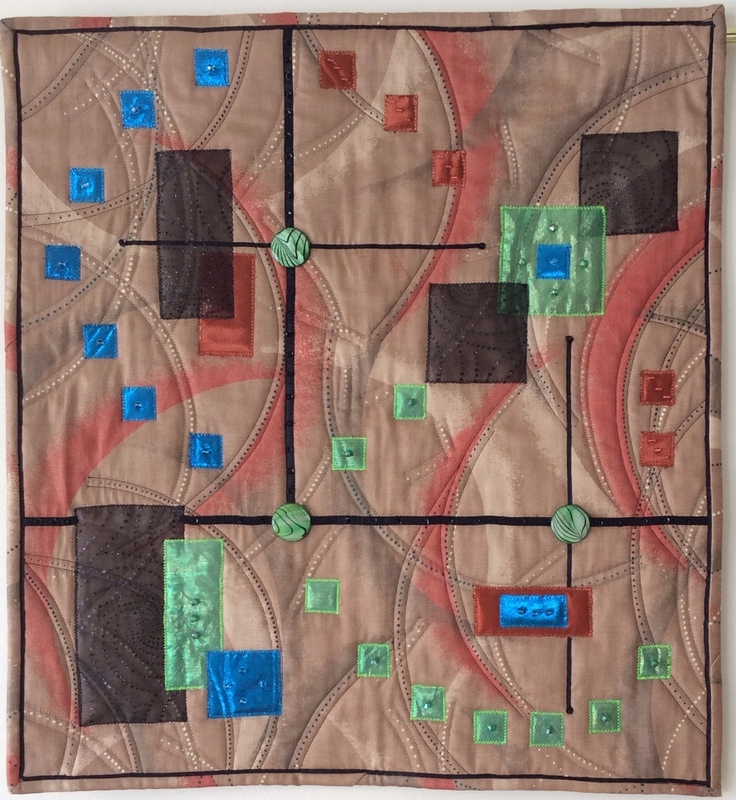 I could not come up with a title for the quilt until I realized that it reflected my recent (and hopefully brief) experience of dizziness and lack of balance associated with an acoustic neuroma. Radiation should have killed the neuroma but the deafness in the right ear is permanent and regaining better balance means doing lots of exercises. Hopefully this will all be a bad memory in another 6 months or so and I can have a happy title for another quilt. I bought Rayna Gilman’s book on Free Form Quilts and really enjoyed the process of sewing scraps of fabric together, then slicing and adding more fabric, combining various groups of sewn fabrics and coming up with a quilt that looks random but is also organized by repetition of color and fabrics. I had a fat quarter of fabric that had rust, blue, and green it and pulled other fabrics that used those colors plus some turquoise and lime green for contrast. Rayna also showed how to have some subdued blocks for resting places so I pieced several strip sets of tan and off white neutrals to include. Most then strips were inserted, but some were fused on at the end when I thought it needed more. The problem was how to stop adding-the process is very addictive. It is quilted in swooping lines with metallic thread. Someone gave me the beaded fringe so it got sewed to the bottom for one more piece of pizzaz. My brother liked the quilt so much, that I made another one in similar colors for him. This may have fulfulled my interest in this technique-but maybe not! 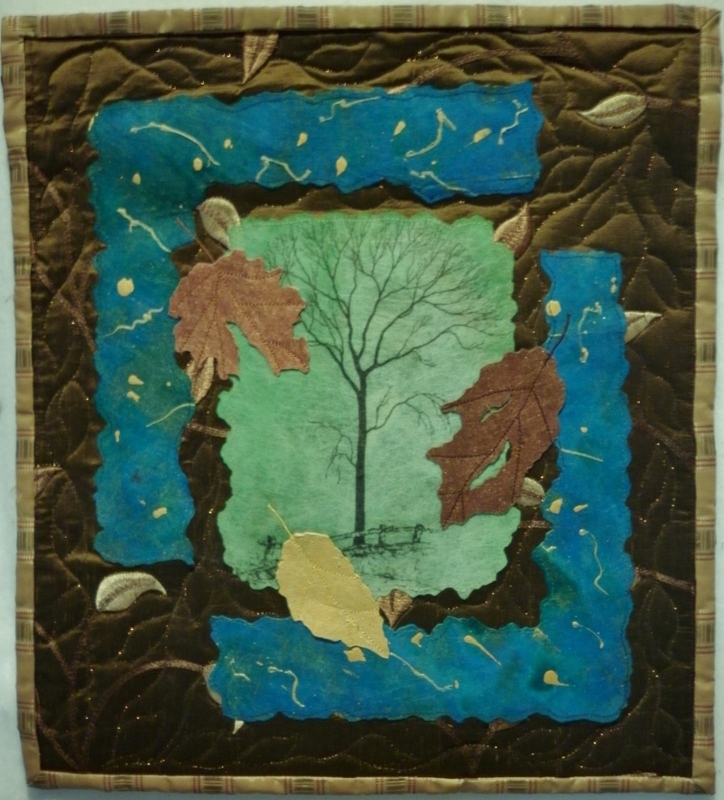 I wanted to play with some lutradur to show people in our art quilt group some of its possibilities. I painted some of it a light green and then ran it through the printer using a tree image from the internet. Other small pieces were painted with brown and yellow and metallic paint. I painted a larger piece with blue paint and put squiggles of yellow paint on top. I was not planning to use any of this-just playing. But then I found the brown silk fabric with the stitched leaves in it and decided that my painted lutradur would all play well together. The edges were cut in irregular shapes using a Creative Versa Tool (I have no idea which tip I used) which is what I like best about using lutradur. I was very pleased with how this turned out but haven’t done anything more with lutradur since! Time to play again. 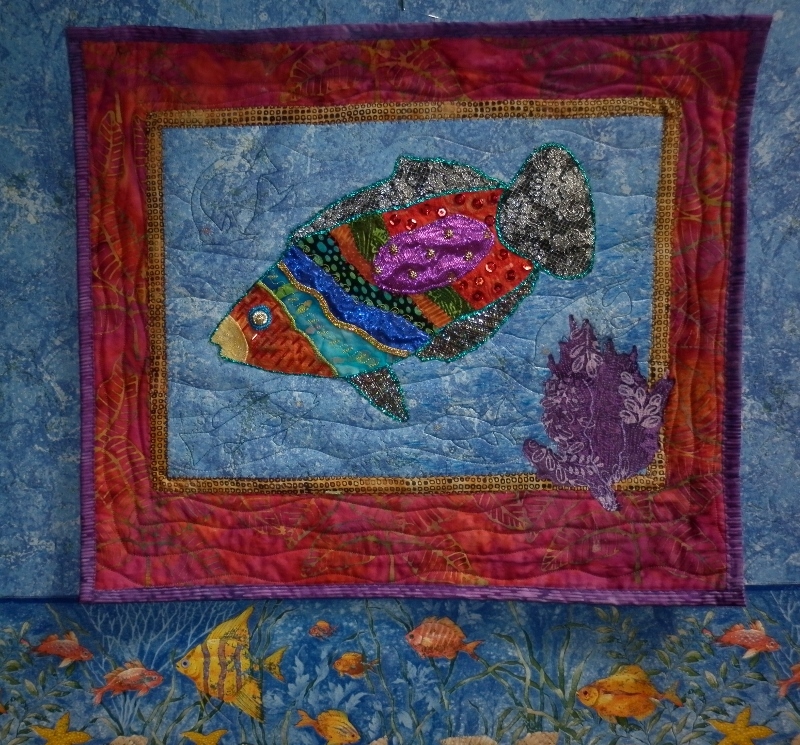 One of the members of our art quilt group had a copy of Susan Carlson’s book with a fish pattern in it. We all brought fabrics to a meeting and shared to create our own artistic fish. I went a little wild with the glitz and the couching so needed a subdued background. Since I knew I wanted to hang this in our bathroom with an ocean theme, I decided to use the same wallpaper for the background of the fish. I tested stitching on it and it worked fine. Then I fused the purple coral and the iron destroyed a bit of the wallpaper. Lesson learned, I glued a larger piece of purple fabric over and stitched it down. Not great art but fun to do and an interesting experience in using wallpaper instead of fabric. 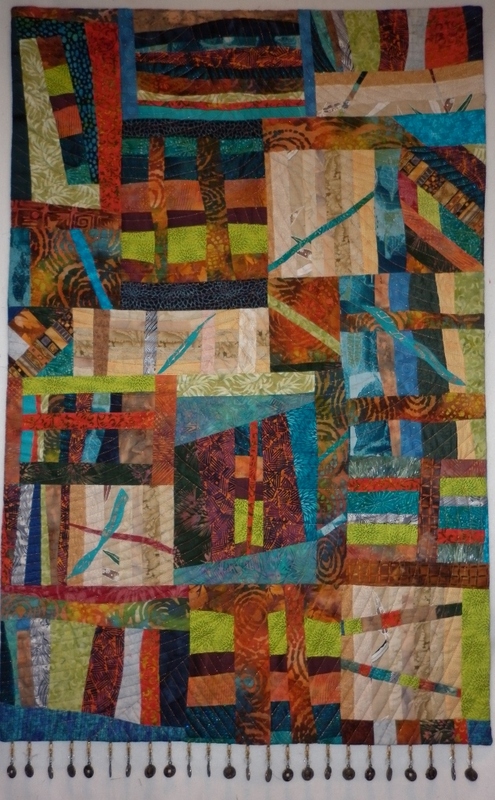 This quilt was started in a class with Jo Diggs in October 2011. It sat on my sewing table until the following July when it was too hot to do any sewing except by hand. I loved picking out the fabrics for the different areas. The hand applique was easy to do. I decided to quilt the piece by hand also to give it some texture and make it look more of my own design. It is stretched on an artists canvas frame. After taking the first day of Jo Diggs’s workshop, I signed up for her second workshop where we worked with a fish theme. The three back ground pieces were hand appliqued to muslin, then the fish, grasses and coral were hand appliqued on top. 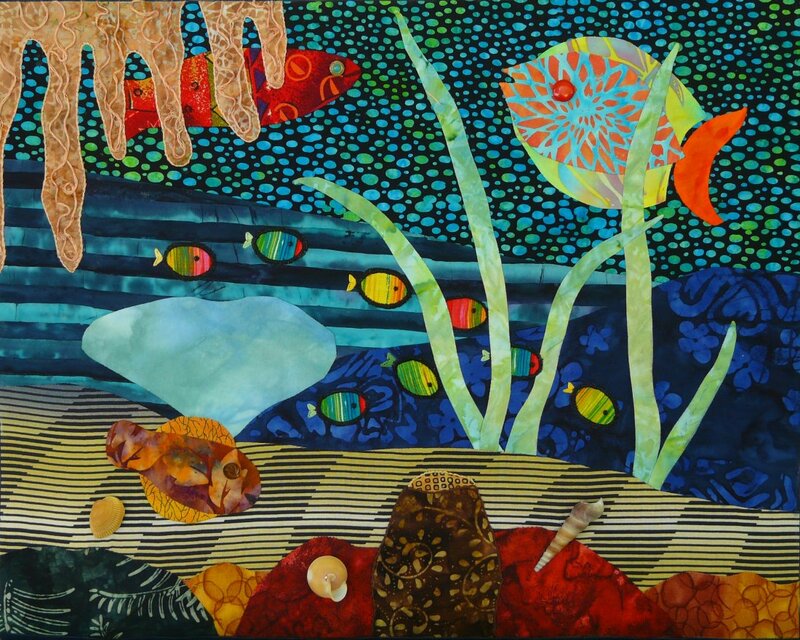 The tiny fish were from a commercial fabric with colored ovals on a black background. I cut them out leaving some of the black around and hand buttonhole stitched them. Beads were added for eyes for all the fish and real shells were attached by glue and thread. I wanted to hand stitch the embroidery floss on the top tan coral but was too eager to finish the piece so just glued it on instead. This piece makes me smile every time I look at it!